Country: Italy | Beer Apprentice - Craft Beer News, Reviews, Interviews and Info. Hello everyone. 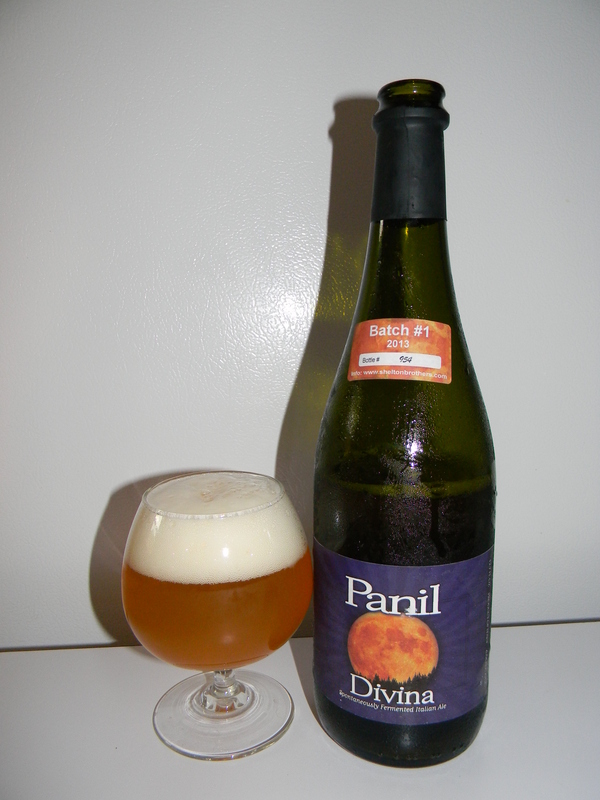 It’s time for another craft beer review and today I’m going to be trying the barrel aged Panil Divina made by the Panil Brewery located in Torrechiara, Italy. I’ve only had one other beer from Panil (the Barrique Sour) and I thought it was very solid, so I have fairly high hopes for this particular brew. The website, www.panilbeer.com, was not functioning properly, so once again we are just going to have to pour this thing and decide for ourselves what this beer is all about. This was from Batch #1, bottle #954. You ready? I am. This beverage came in a 25.4 oz. bottle and it had an ABV of 6.5%. It poured a hazy, orangish/yellow color. The crown was white and sized well. The texture was soapy, soft and semi-fizzy. The retention time was ok and the lacing was just ok as well. I was hoping for a better aesthetic appeal, but oh well. The aroma released a nice bit of sourness and funkiness. Hints of lemon pith and a bit of apple intermingled with freshly cut lumber and soured grapes. I received a very odd and puzzling gun powder aroma too. I can’t say that I’ve ever smelled anything quite like that before. It wasn’t necessarily bad, just very unique. The taste expelled a nice shot of sourness right off the bat in the form of red apple and white grape. Again, a pleasant savor of woodiness was exposed, however toward the end I started to detect a plastic type of flavor that became a wee bit distracting. Hmm. The mouthfeel was medium bodied. Mostly smooth, but crisp at the same time. It was dry and just a touch of warmth was felt from the alcohol. The carbonation was of medium strength and a pretty good dose of flavor was left behind after each gulp for me to enjoy between sips. Truthfully, I was a little disappointed in this beer. It came highly recommend from my bottle shop, yet that weird plastic taste and gun powder aroma really became more intense as I worked my way through the bottle and I don’t necessarily think those are characteristics that I want to continually be reminded of when enjoying a beer. It could have just been me though. There were some pleasant attributes however, so I’d still say give the barrel aged Panil Divina a try just to see what your opinion of it is. You may obtain an excellent bottle and be totally blown away by it. If so, leave me a comment and tell me of your experience. Hello again guys. Hope all is well. For today’s craft beer review I’m going to be trying the Panil Barriquee Sour produced by the Panil Brewery located in Torrechiara, Italy. I haven’t had too many Italian beers in the past, but this one comes highly recommended. Originally this version was available for the American market, while in Europe a version less sour was available; as of today, only this version of Sour is produced, so if you got a recent vintage you had this one. The Sour has a sticker to differentiate it from the sticker-less Barriquée Mild, which has not been inoculated with lactobacillus bacteria. This was batch #15 and it had a bottle # of 1164. It came in a 25.4 oz. vessel and the ABV was listed at 8.0%. It poured a deep brown to dark ruby color. The crown was slightly off white, well sized, creamy, soft and mostly smooth. It was a bit fizzy on the initial pour, however it leveled and calmed down to hold its form. The retention time was more than adequate and the lacing was very thick and clingy. The nose brought forth some beautiful tones of soured dark grapes and black cherry. A nice and well blended fragrance of wood and oak helped to counterbalance those tart fruits. A slight vinegar redolence was welcomed as it only became noticeable as the brew warmed. The taste presented a very manageable amount of sourness from the dark grapes and dark cherry. Again, only a minor touch of vinegar was noticed and the tartness seemed to be tamed quite a lot as well. The wood and oak gave the impression of being way more forward in the taste than they were in the aroma. I also noticed some dark breadiness in the there also, which I didn’t find in the nose. The mouthfeel was medium bodied. Very dry, slightly sharp and bitey with a very mild, subtle warmth from the alcohol. The carbonation was very good and of medium strength. An excellent amount of flavor was left covering the palate long after each sip. Overall, I thought this was a very, very nice beer. It was not one of those overpowering, completely lip puckering Sours that I’ve run across from time to time, but it definitely provided enough of that characteristic to keep me satisfied for the duration. It was well balanced and solid all around. Not to mention the fact that the drinkability was way better than average. 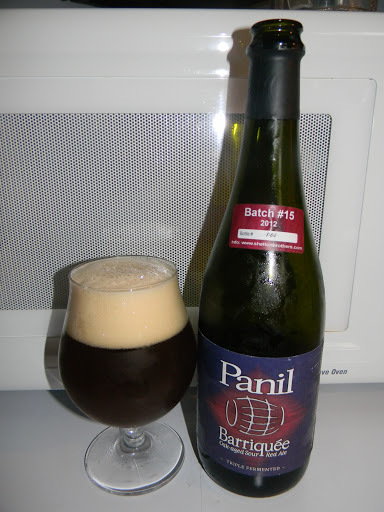 I’d have no problem recommending the Panil Barriquee Sour to anyone looking to try a seemingly rare beer. I’d never turn it down that’s for sure. Have you guys tried the Panil Barriquee Sour? What was your impression? 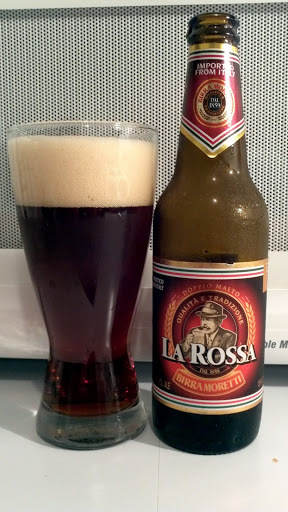 For today’s craft beer review I’m going to sample a beer from Udine, Italy called the Birra Moretti La Rossa. It’s brewed by Birra Moretti (Heineken). This will be the first time that I have ever tried a beer from Italy, so……. Let’s see if we can find a description from the website, birramoretti.it. It’s distinctive amber colour originates from the type of malt used when brewing, a special malt which is dried and roasted. This brew came in a 12 oz. bottle and had an ABV of 7.2%. The color was a very nice, clear, “iced tea” color. Burnt orange and ruby red highlights abound throughout. It had a very light tan head that was smooth and mostly creamy looking. It showed good size, “ok” retention and decent lacing. Once the head settled it basically vanished and was never seen from again. The aroma was slightly roasted with hints of nuttiness. A subdued caramel and toffee sweetness add some delight along with a fragrance of, what I thought to be, Christmas spices. A very light alcohol note was detected deep within the smell. Not a bad a fragrance here. The taste was very similar to the aroma. Roasted nuttiness with relaxed caramel and toffee sweetness. The spiciness is faint, but definitely noticeable. It also had a dry, “leafy” type of distinction that fit in well with the overall profile. Only a touch of bitterness was noticed and the alcohol tone was barely there. It seemed to be balanced well and the taste remained consistent throughout. The mouthfeel was medium, very dry, smooth, soft and fresh. A nice amount of flavor was left behind on the palate, but not an overabundance. Well, this beer is “ok.” It’s nothing to write home about, but it’s definitely drinkable and worth a try if you happen to see it. I could probably have 1 or 2 during a sitting with no problem. The aroma was nice and the taste wasn’t too bad either. I’m not a huge fan of Doppelbock’s, however this one was pleasant enough. I could see myself having one of these on a cool Autumn evening, relaxing on the front porch while watching the leaves fall. As always, thanks for reading and commenting everyone. I really appreciate it.